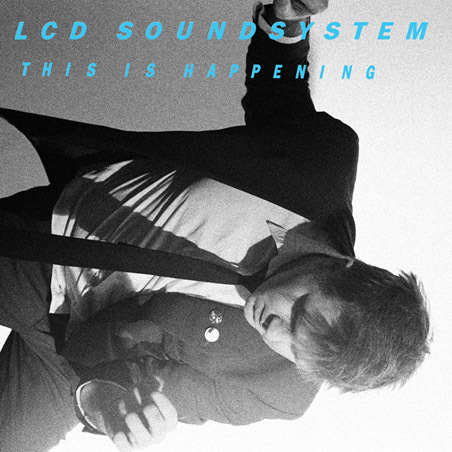 Although officially not released until May 17th (18th in US) the album has leaked everywhere, with The Hype Machine seemingly display the album’s tracklisting available to download right now, and James Murphy putting the whole album on his LCD website for streaming, I think that most people concerned about his bowing out of the seminal post-punk/disco/electro/dance solo (performing troupe) act have actually heard the album. And dare I say it, it’s a magnificent piece that effectively gives a decisive closure to the band. This IS Happening. It opens with the fantastically awkward, incredibly danceable “Dance Yrself Clean” that, unlike it’s most obvious Predecessor, “Someone Great” from the seminal 2007 Sound Of Silver album, actually builds past that anxious, growing beat into an insatiable song that you must find it hard to defy at least tapping your feet along to. Clocking in with an opener at over 9 minutes long, it’s hard to look past it, it sets up the rest of the album so well it’s just so omnipresent in my mind and my lasting impression of the album, every strained uttering of “So, dance yourself clean” from Murphy’s singing seemingly etching itself on the inside of my imagination. It’s a great testament to the fact that James Murphy can craft some amazing, ridiculously memorable and heartfelt music because the whole album continues the brilliant work he has established over the last five years with two albums, e.ps and single releases, oh, and one Nike-commissioned workout ballad. Even with songs that critics consider weaker, like “Drunk Girls”, the first single from the album, that follows the same tradition as “Daft Punk Is Playing At My House” and “North American Scum” from his previous albums as the incredibly up beat dance single, it is brilliant, yeah, it’s probably weak and dumb lyrically, with the affectionate, “Drunk Girl” chant, but it still achieves at pushing the listener into what would appear to an onlooker an MDMA-induced dance frenzy. By the time “I Can Change” kicks in with its 80s synth-pop inspired opening and again Murphy’s mellower crooning, you’ll feel an overwhelming sense of urgency, of longing and of lust, every single time he chants “Love is a Murderer”, there is something about that this song that just envelops my emotion into something completely unknown to me. The titular chours, “I can change, I can change, I can change, if it helps you fall in love” is so heartfelt and honest-sounding from Murphy that it brings in such a sadness, an acquiesce in this lyrical story that you want to believe in and fall for. You basically want to fall in love with his honest, loving and most of all begging lyrical persona. The album follows with the next song, “You Wanted A Hit” that opens with what seems to be an oriental-electro opening, paving way for a subtle, but encroaching bass line and hand clap, Murphy snarls “You wanted a hit” around the 3 minute mark, in what seems a lambasting attack on the record industry, and his description of the pressure put upon, perhaps himself, to write the best (and most profitable) music of his career. Yet, he seems to fight against it, again his lyrical persona is so strong and frightening even, in that shift from heartfelt to vicious, that you side with him and believe what he is saying, the choral chanting of “We won’t be your babies, anymore” is effectively a two-fingered salute to the record industry. But during the whole of this, the hand clap and bass remain, a subtle base to the song that, ironically, helps to construct a song that almost definitely could be a hit. The last song on the album, “Home”, helps to make this journey at lot more full circle. It again sees Murphy, like on the album opener, speaking directly to the listener, in fact as if you’re his best friend. It has such a happy feel to it, it’s a song that you can shimmy around the room to, whilst contemplating lyrics that recollect everything in your life. It’s deep, yeah, but it also speaks to everyone who could enjoy it. It’s music to celebrate to, and join in with his happiness, this is the way it should end, not in sadness but in rapture, in ecstasy as James Murphy is closing, finalizing this monumental impact that he (and DFA Records) have had on the music world, LCD Soundsystem’s This Is Happening is an album that every man, woman and child should enjoy because it has a whole spectrum of emotion and of sound. Album of the year? I certainly think so. This is not on the album, but most definitely worth a listen. Album of the year, no doubt. The first track, among others, is greatness defined. can you reupload the file,please? The line “We won’t be your babies, anymore” I imagine is not aimed at the record labels, who the have had a good relationship with (I mean they gave them a mansion in LA to record their album) but more at the press (i.e. ye) and the journals who have promoted them to the “critics’ darling” status they unenviably hold. Yeah I can see your point, but then lyrics are open to interpretation, I assumed the whole song was an attack on the “hit culture” of music that seems to be quite prominent, in that bands don’t seem to surface permanently as much unless they actually get critical success, as labels constantly drop those “under-performing”, i thought he was casually attacking such a demanding industry, but yeah lyrics are open, i like your interpretation too. Lovin’ the new CD. “One Touch,” “You Wanted a Hit” and “I Can Change” are on heavy rotation. LCD rules!! !